Opening on 15 February 2013, Friday, 6-9 PM. Artist and Curator talk on 15 March 2013, Friday, 5-7 PM. Exhibition runs until 12 April 2013. A Reading of Brightness, Dark Clouds Surrounding, an exhibition by Yason Banal, forms the final part of End Frame Video Art Project 3, the 2011-2013 video art festival featuring solo exhibitions of Philippine artists presenting new video work. Presented by the Cultural Center of the Philippines and Visual Pond, the exhibition opens at the Bulwagang Fernando Amorsolo (Small Gallery), Pasilyo Victorio Edades (4F Hallway Gallery) and 4F Atrium, Main Theater Building, CCP, on 15 February 2013, Friday, at 6 PM. An artist and curator talk will be held on 15 March 2013, Friday, from 5-7 PM at the MKP Hall on the same floor. A Reading of Brightness, Dark Clouds Surrounding in part takes inspiration from the former Senate Hall at the National Museum, the Thirteen Artists Awards at the Cultural Center of the Philippines, and the Claudio Bravo exhibition and Fundraising Gala at the Metropolitan Museum of Manila. The exhibit reflexively ties this in with the recent boom in Philippine contemporary art and how such a growing interest is somehow linked to institutions, patronage and cultural heritage, as much as lifestyle, identity, and notions of value, power and taste. The work of Yason Banal moves between installation, photography, video, performance, text, curating and pedagogy, taking myriad forms and conceptual strategies in order to explore, perhaps even trigger, suppressed associations and links. He has been exhibited locally and internationally, including the Tate, Frieze Art Fair, IFA Berlin, The Courtauld, Sotheby’s, Guangzhou Triennale, Singapore Biennale and most recently at The Queens Museum of Art, Shanghai Biennale and www.artworld.biz. 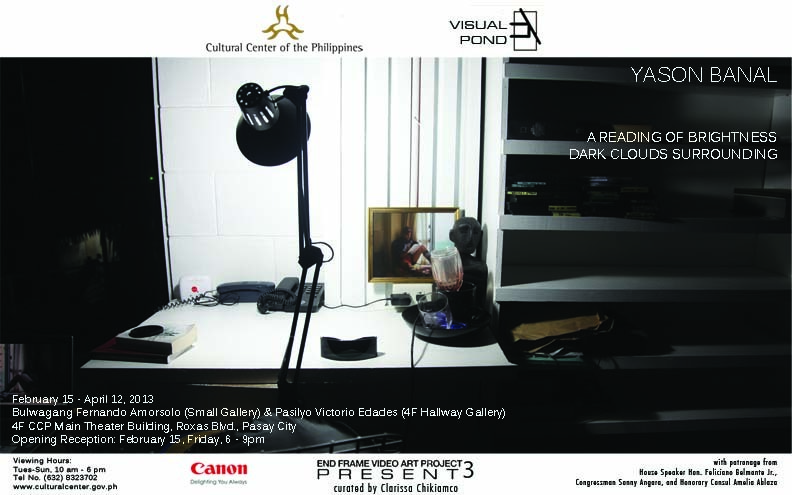 The banner project of Visual Pond, End Frame 3 is curated by Clarissa Chikiamco. The theme of the third edition, Present, refers to the project’s focus on the current video art practices of selected Philippine contemporary artists. Other artists who have presented for End Frame 3 are Tad Ermitaño, Manny Montelibano, Claro Ramirez, Kiri Dalena, Kaloy Olavides and Maria Taniguchi. A Reading of Brightness, Dark Clouds Surrounding has patronage from House Speaker Hon. Feliciano Belmonte Jr., Congressman Sonny Angara, Honorary Consul Amelia Ablaza and Canon Philippines with special thanks to Geiser-Maclang and Josiah’s Catering. The exhibition runs until 12 April 2013 with gallery viewing hours from Tuesday to Sunday, 10 am to 6 pm. For more information, visit www.culturalcenter.gov.ph or call the CCP Visual Arts and Museum Division at (632) 832-1125 loc 1504/1505 or 832-3702.